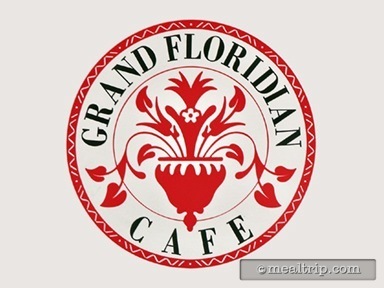 The Grand Floridian Cafe is a lightly themed Victorian era, casual (i.e. mid-priced) table service restaurant located on the first floor of the Grand Floridian Resort. The main entrance is accessible from the main interior building and generally doesn't serve dinner as late into the evening as some of the other Disney resort restaurants. On most nights, the last seating happens just before 9:00pm. The American Classics menu is modest and seems to be comprised of just enough for everyone to find something to order. One, fish, shrimp, burger, pork, chicken, steak and vegetarian entree, with a few additional appetizers and desserts comprise the entire dinner menu.